To embed or de-embed? Why not both? 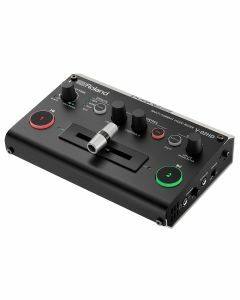 The V-02HD not only lets you embed analog audio into an HDMI signal — for recording or live streaming — but you can also extract the audio from an HDMI signal to send over to a larger dedicated audio mixer. Where many converters only support digital audio, or offer either embedding or de-embedding (and not both), the V-02HD lets you do it all. The V-02HD has three-band EQ and dynamics onboard, so you can immediately optimize your audio without having to send to an external mixing desk. A built-in effects library is packed with presets for common production scenarios including interviews, ambient sound recording, and eliminating wind noise when filming outdoors. These tools even work with inline HDMI signals, so you can fix your audio issues without leaving the digital domain. It’s frustrating when your switcher needs one more input and you’re all out of options. With two extremely low latency inputs, the V-02HD provides that prized additional connection without adding any perceptible delay to your camera inputs. And with high-resolution 10-bit 4:4:4 color space, there’s no signal degradation either. Although adding effects via your editing package is becoming easier, more complex effects — for example, blurring a person’s face for privacy purposes – require time and extensive knowledge of video-editing software. Or you could just add the effect directly to the camera’s output and record the result. The V-02HD has 14 visual effects that can be applied in real-time, with adjustable parameters to fine-tune the results plus an additional 5 composition effects so you can add titles, use a green screen with the Key effect, or create a separate inset window with the PinP capability. When an input source fails in a presentation or a new speaker arrives but isn”t ready to present, the last thing you want to display is a blank screen; or worse, content that wasn”t meant to be shared. You can be ready with a still image loaded into the V-02HD placed in between a switcher that doesn”t have still image capability and the output display. Simply switch over to the still image in case of emergency.